Strange thought of the day: I think veggie chili recipes might be like having kids. Maybe you have a lot and say they’re all your favorite, but you’re really being honest. You love each of them in a totally unique and unconditional way. Weird? Very. Especially considering I have only one child (maybe the two dogs count?). But I do have veggie chili recipes (several of them, at this point), and it’s the only logical comparison I can draw. It’s clear from this list that I have a problem taking a perfectly wonderful recipe and repeating it. No, I have to explore, making a different veggie chili every time the urge strikes. So, when I was planning a “practice run” for my personal chef service, making four dinners in six hours, I couldn’t just pull a familiar recipe from the list above. 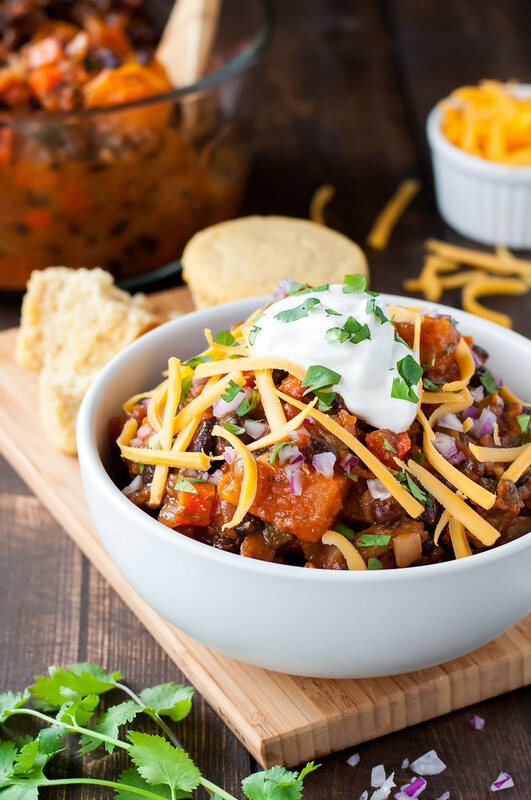 I had to perform two hours of research to determine how I might streamline the ingredients and process to arrive at an easy, quick, but football party-worthy chili recipe. And folks, it was a success. 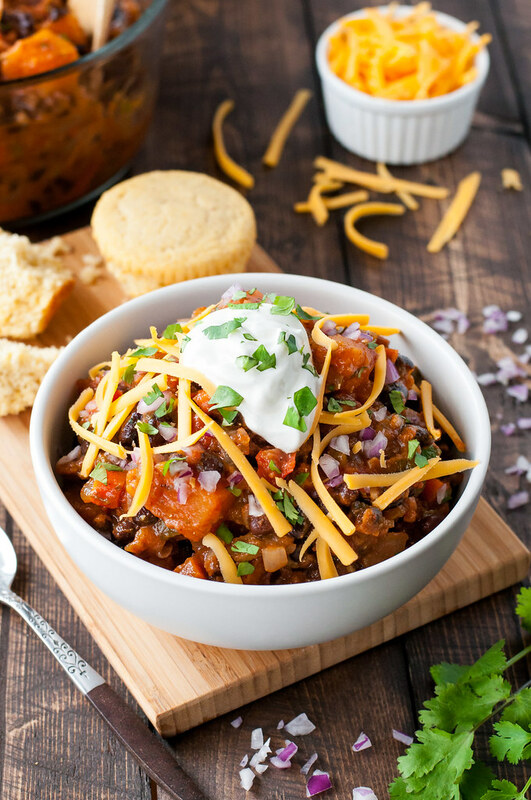 Thanks to a little inspiration from the Pioneer Woman, I’ve finally arrived at a chili recipe that can be accurately described as both mouth watering and weeknight friendly. You might wonder what food blog universe I reside in, sharing chili recipes at the onset of spring. Isn’t this the time to be snapping endless pics of asparagus and talking incessantly about the impending rhubarb crop??? Probably. And I love seasonal produce as much as the next food blogger, but I also adore comfort food all year. I’ll associate it with my upcoming 30th birthday, but I’m comfortable owning my cravings and admitting that I’ll never be a 5-day-a-week salad eater. Not gonna happen. 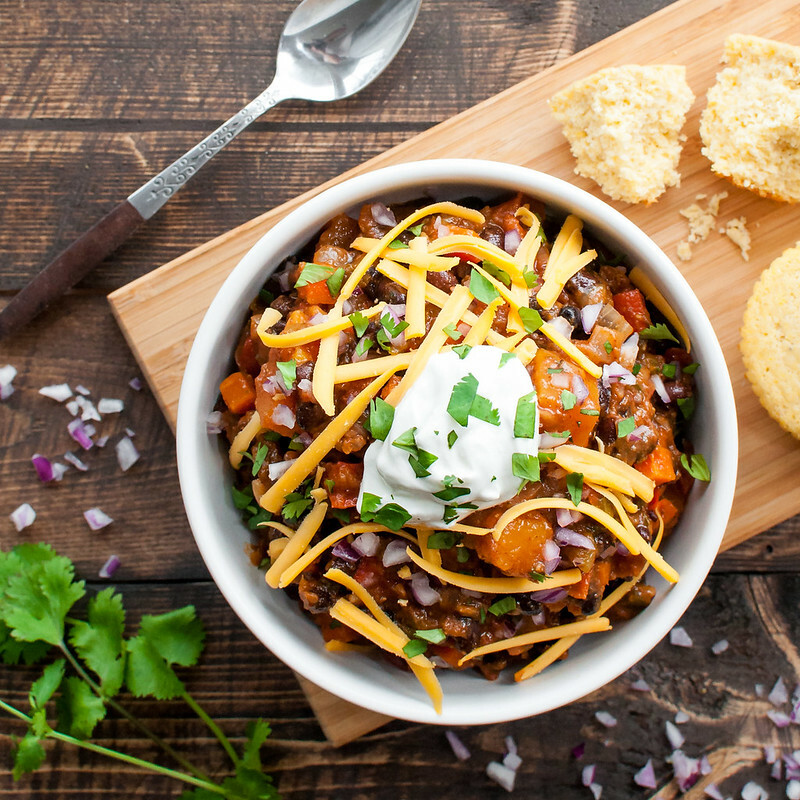 Luckily there are so many healthy veggies in this pot o’ chili that it might as well be a salad. 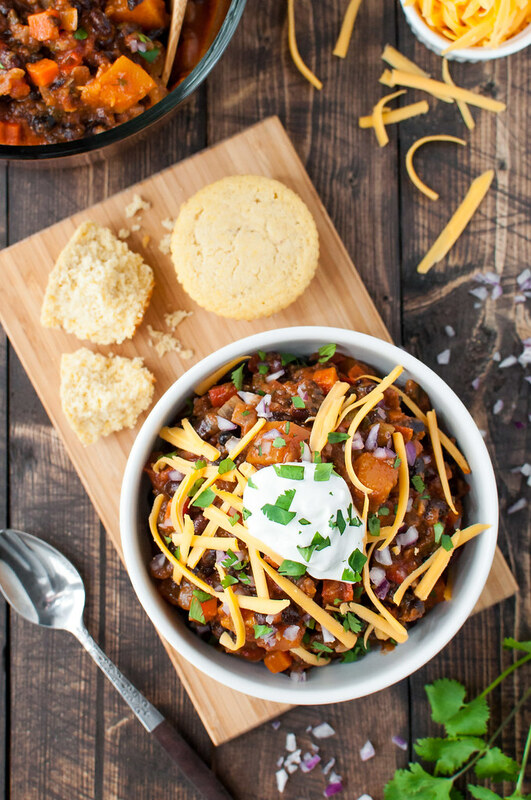 Yep, it is another vegan recipe out of my kitchen, but topping it with cheese and sour cream alongside a buttery gluten-free corn muffin makes me mighty happy. Totally up to you, though. Vegan or cheating vegan (or unashamed-but-feeling-healthy omnivore), this is a no judgment zone. Butternut (or another winter) squash is perfect in this recipe, as it stands up to simmering without falling apart. However, if it’s not winter squash season as you read this, I encourage the use of seasonal squash. Zucchini and summer squash to be specific. If that’s the route you go, do not add the squash with the tomatoes and broth. Summer squash are tender and will cook in much less time than dense, hard butternut. If you’re not careful, you’ll end up with mushy zucchini in your chili. What to do? Follow the recipe, without adding the squash, and simmer until the chili is ALMOST as thick as you want it, but slightly soupier. At that point, add the squash and continue to simmer. When the squash cubes are almost cooked through (taste one), add the cilantro and corn flour, so the squash finishes cooking as the chili absorbs the cornmeal. As complicated as that might sound, I have confidence in your squash-tasting skills, and, even if you slightly overcook the summer squash, it’s not the end of the world. For a rainy summer day, substitute zucchini for a seasonal version. The recipe doubles well, and a double batch will use most of a medium butternut squash. Makes 2 quarts. In a large pot, heat oil over medium high. Add carrot, onion, bell pepper, garlic, and jalapeno. Cook, stirring frequently, until softened and starting to brown, 5 to 10 minutes. Add chili powder, cumin, cayenne, epazote, and ½ teaspoon salt and stir constantly for 1 to 2 minutes, until spices are fragrant and sticking to the pan. Pour in the diced tomatoes with juice, vegetable broth, diced green chiles, beans, squash, and tomato sauce. Stir and raise heat to bring to a boil. Reduce heat and simmer, partially covered, until squash is cooked through, about 35 minutes. Stir every 5 to 10 minutes. In a small dish, mix cornmeal or masa with 1 tablespoon of water until smooth. Pour into chili, stir well, and simmer another 5 minutes. Turn off heat and add cilantro and juice from the lime. Season to taste with more salt. Since cooking this for a bland-food-loving toddler, I omit the jalapeno and cayenne pepper and it's STILL delicious. Try adding hot sauce to individual bowls. You can substitute kidney or pinto beans, if that's what you have or you don't like black beans. Before toppings, recipe is gluten-free and vegan (confirm ingredients in spices, stock, and other packaged items to be certain). Note: This page contains affiliate links. It does NOT contain sponsored content. 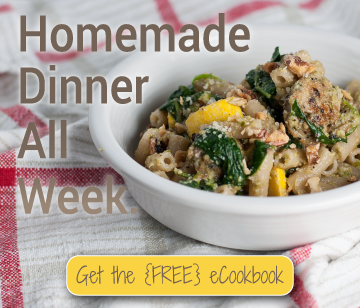 Affiliate links (to products I recommend, on Amazon) offset my ingredient and website maintenance costs, so I can keep bringing you steamy recipes like this one. Thanks! Awesome photos! We’d love it if you’d submit some to JalapenoMania.com! Thanks Kristy–I’ll check out the site!